For over two years, Natasha “Tash” Feldman has been a private chef in Los Angeles, cooking for up to seven hours a day. When it’s time to hit the grocery store, she employs two money-saving strategies: buy in-season produce and check out what’s on sale. Feldman said this helps her create new and interesting recipes that are cost effective. 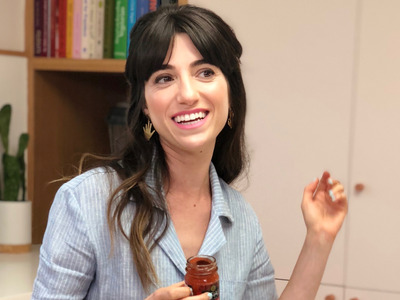 Feldman has competed on Food Network’s “Chopped University,” as well as “Cutthroat Kitchen,” but she told Business Insider she still believed TV-worthy meals should not be a dinner-at-home goal. After spending up to seven hours a day cooking for other people, she understands the struggle of coming home and cooking for herself. But she said America’s obsession with dining out leads to unhealthy habits and empty wallets. She created “Nosh with Tash” to showcase recipes that are easy to make with a quick trip to the grocery store and tools that are most likely already in your kitchen. Feldman wants her recipes to help home cooks make simple meals that match restaurant quality. Feldman said that while shopping for groceries, she always buys in-season produce. “You can get the most beautiful delicious produce at basically any grocery store for a good price at the peak of its season because they just get more of it at a low price,” she said. Feldman looks for someone working in the produce section and asks what’s best and most fresh and what excites the person the most. “For the most part, people who work in produce sections love produce and are more than happy to tell you about things and open up a nectarine and let you try it and sort of go on this journey with you,” she said. One of Feldman’s best grocery-shopping hacks is checking out the sale aisle. “Sometimes I like to make a ‘Chopped’ challenge just for myself where I’ll go through the aisles and look for things on sale,” Feldman said. She says she frequents markets like Whole Foods and Bristol Farms – stores Feldman says have “extraordinary” sale items daily. After cooking for other people all day, Feldman said, it can get exhausting to think about returning home to make dinner. “People often think when you work in food it’s just so much easier, but the truth is you still have to make relatively easy recipes – like nobody just goes home and whips up an incredibly complex 12-course meal just because they work in food,” Feldman said. She also understands it can seem difficult to budget and plan meals for one person, but there’s an easy solution.